Be aware: What you save in cash on a yard sale bargain may cost you in karma. This is the story of my new 1-terabyte hard drive. I don’t feel at all guilty about the new iMac I bought for my office. I am, however, experiencing some real stress about the brand-new 1-terabyte Western Digital hard drive I’m using to handle Time Machine backups for the iMac. That’s because I only paid $5 for it. “Sure,” I said, vaguely registering something called “My Book.” I figured it was a kid’s toy of some kind, or perhaps a little gadget for digital photos. It was only the following day that I saw the “My Book” on our mail table, took a close look, and realized it was a brand-new 1-terabyte hard drive. I looked online and discovered that it sells at places like OfficeMonster for between $125 and $175. “That much?” Tom marveled. He’d assumed it was something old and out of date. Obviously, there’d been a terrible mistake at the yard sale. But we couldn’t remember where the yard sale had been. On the way to the store the next day, we drove through the neighborhood where the sale had been, but the sale signs were down and all the neat little blocks looked the same. So, there we were. With somebody’s expensive hard drive, and a bit of guilt. But, wait — the story gets worse. Or better, depending on your sense of humor. A week or two after the yard sale, I was at the local OfficeMonster buying what I always seem to be buying there — HP ink cartridges. I got into the checkout line and sighed. Our local OfficeMonster has a cashier ( let’s call her Brunhilde) who is slow as an ancient laser printer. She asks you if you need any of their weekly specials and goes through each item while you vehemently say “No” to each one. She asks if you have your special coupons — and clucks at you if you don’t. She asks if you have your OfficeMonster Preferred Dinosaur card. And she enunciates every syllable of it all. The handsome man in front of me in the line looked about ready to strangle Brunhilde. He was clearly in a hurry. He had only one item on the counter, was waving cash, and his two adorable little blond children were tugging at his leg. “Daddy’s hurrying,” he told them through clenched teeth, as Brunhilde droned her way through a list of weekly specials. She finally rang up the purchase, and that’s when I noticed the item the fellow was buying. It was a bright green shrink-wrapped box. It looked familiar. So, come to think of it, did the two adorable little blond children. I’d seen them, and a 1-terabyte Western Digital hard drive, before. At that yard sale. I opened my mouth. And closed it. And opened my mouth again. And closed it. This was tricky. I realized that if I told this man I’d purchased his hard drive at a yard sale a few weeks earlier, I stood a chance of creating a larger problem than I was solving. If he’d been assured by his wife that his hard drive was “probably lost,” and I stepped forward with information that confirmed his darkest suspicions that it had been “lost” in her yard sale — well, things could get ugly. And then there was Brunhilde. Triggering something that would result in her having to void a purchase would hardly make us popular with the long line of OfficeMonster customers already fidgeting behind me. While I stood there weighing my options, the two adorable blond children were dragging their grouchy dad and his new hard drive out of the store and into the parking lot. Brunhilde had grabbed my ink cartridges and launched into her recitation of the weekly specials. I nodded along, in a daze. To her delight and amazement, I accidentally bought 10 reams of OfficeMonster paper. At least someone was having a good day. That night, I told Tom what had happened — and not happened — at the office supplies store. “Oh my,” was all he said. I’m now enjoying the 1-terabyte Western Digital hard drive, but remain aware that what I saved in cash I probably spent in karma. So we’ve resolved that the next time we have a yard sale we’ll include one or two really spectacular bargains. 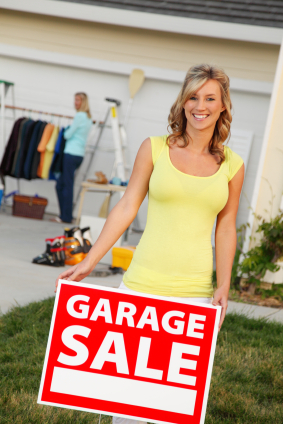 Can I have early notice of your next garage sale, please? File under “you cannot make this stuff up” – Karen, you live a charmed life – and did you say woodworking tools. . .